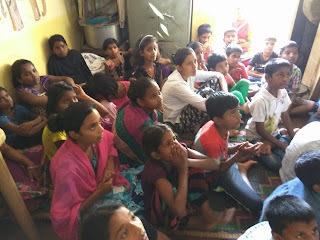 12-May-2018, Chinchwad (Pune): The Don Bosco Development Society (DBDS), Chinchwad organized an interactive session on ‘Road Safety and Traffic Rules’ for the children in Durga Nagar slum in Pune. 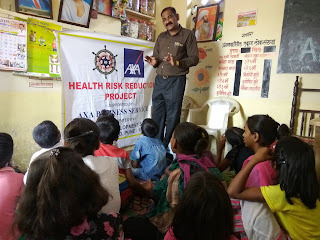 28 Children participated in this session which was held under the aegis of ‘Health Risk Reduction’ project supported by AXA Business Services Ltd. The objective of the session was to educate children on traffic rules and prevent road accidents. Ms. Lalita chaudhrai (Coordinator - DBDS) introduced the Resource person to the participants and shared information about the project. 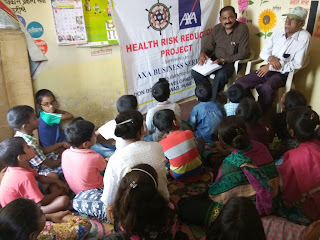 Mr. Dadarao Aadhav (Police Mitra) was the resource persons for this session. 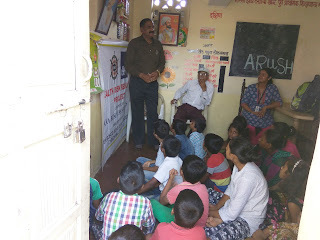 In his talk he covered various DO’s and DON’Ts related to road safety and draw traffic symbols and explained their meaning. He explained how one needs to be cautious on the road specially the Old Mumbai-Pune highway which pass through Chinchwad. He also educated children on helping victims of road accidents; in case of accidents always call police by dialling numbers: 100 & 103. 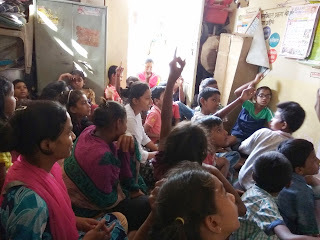 In the end snacks were served to all the children and Mrs. Vibhawari Kamble (staff - DBDS) proposed the vote of thanks.